The following notes give us a clue as to where we might want to look next for the link to Elizabeth BREAKEY's ancestors. 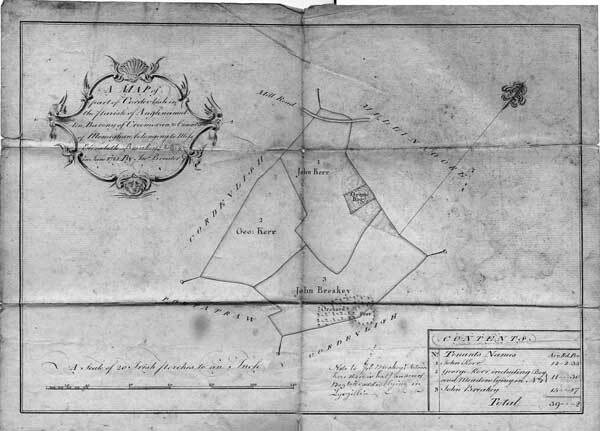 The map to the right was drawn in June 1781 and was likely done as part of the agreements leading up to the marriage of Elizabeth BREAKEY to Thomas Bradford on August 27, 1781 (SOURCE: Family Bible at Gilford Castle). 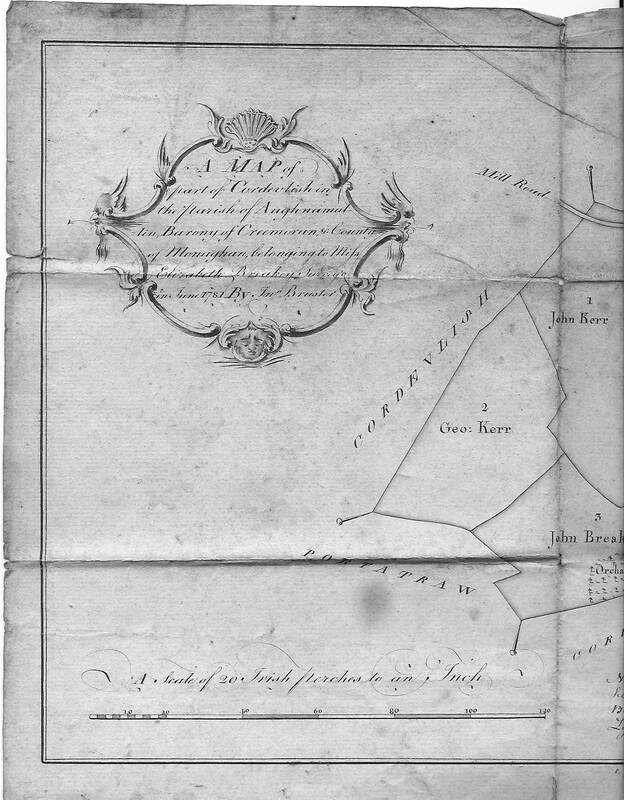 The following notes can be found in The Breakey Collection in an article "Isaiah Breakey of Greenvale Mills" by Kenneth C. Breakey and Marilyn J. Breakey, Appendix F.
"Verner, the head landlord, leased land for 3 lives in 1750 to William Breakey of Lisgillen, John Brekey of Corryhagan and John Breakey of Cordevlis [footnoted: R. D. M. ref: 158, 407, 106506; 158,408,106508, 158, 409, 106510]… The leases were for lands already in their possession. The locations are significant: each townland has an extended border on the Ballybay river which provided them with a convenient source of water. 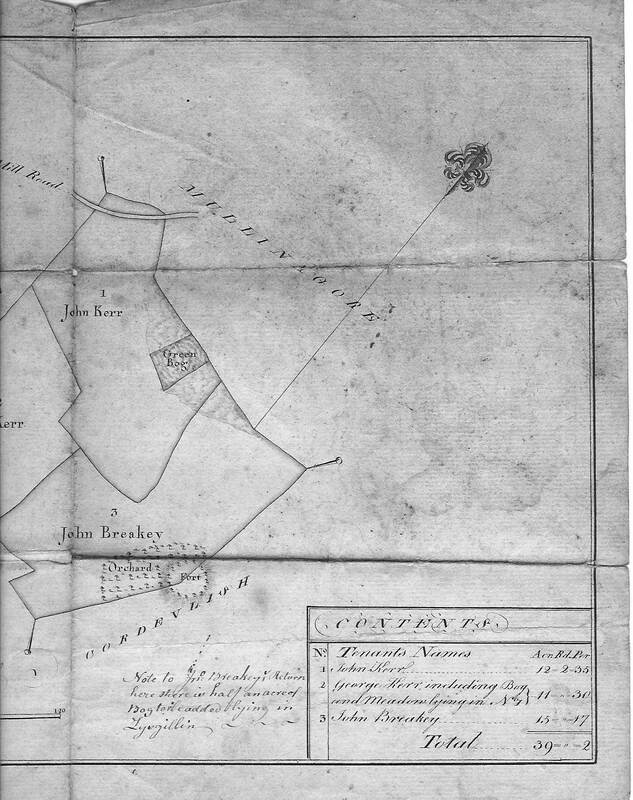 William Breakey had portions of land also in Creeve and Carnaveagh…They do not seem to have built a bleaching mill until the 1780s when John Ker leased land in Lisnagalliagh to William Breakey and John Breakey [see above]. " Thanks to Wendy Jack, I now have a version of this map (above) which is viewable all at once. Since the writing is hard to read at this size, I am also including the version beneath which has the virtue of being large enough to read with ease, but the handicap of being in two pieces. It's one of those times when we don't have what we want, but at least we do have what we need - between the two versions, that is.